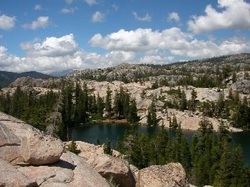 Two Sentinels is located in the High Sierra, surrounded by granite peaks and evergreen forests. 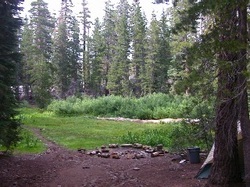 We sit on the edge of Lake Kirkwood, a small and quiet lake loved by campers for over seventy-five years. 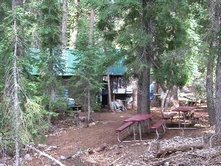 The camp itself is on leased National Forest Service land. In the central camp area there is the flag circle where flag ceremonies are held twice a day, the Birdhouse (infirmary), the kitchen and outdoor dining deck, the Cookie Jar (which houses the cooks and the directors' office), and the Staff House, where staff pick up camper mail and take daily breaks. Other communal areas throughout camp include the craft hut and nature area, the waterfront, the archery range, Cricket's Hearth (our all-camp campfire), and the backpacking area (where equipment is stored and packing occurs). The view from the Meadowlark unit. Every unit area has a communal unit house or platform tent in which to sleep and store gear. They are located in close proximity to a biffy (outhouse), trough (with running water), and shower house (with hot running water). 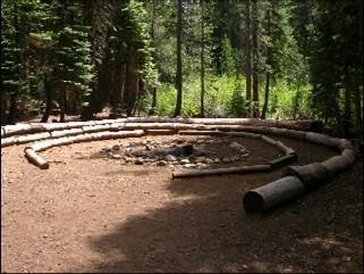 Most units have a small campfire circle for cookouts or marshmallow roasts. Path from the Meadow to the Dining Deck. Our site has hot and cold running water, largely due to the efforts of volunteers in 1994, who dug the entire water line from the highway to camp in one weekend. We do not treat lake water; instead, we get all our water from the safe and secure municipal water supply. The hot water heaters in the three shower houses and the stoves in the kitchen are powered by propane tanks, which are filled off-site and rowed into camp. The camp does have a generator that runs during daylight hours to power the walk-in refrigerator and the lights in the Birdhouse (infirmary) and the kitchen. There is no electricity available to campers. There are no flush toilets anywhere at Two Sentinels. We use Biffies (Bathroom In Forest For You - outhouses) which are cleaned and sanitized daily by staff. Campers are not allowed or expected to clean outhouses or shower houses.